Last week I had the pleasure of helping in a “bio-blitz” at Deer Haven Park in Delaware County. It’s a nice park, even though the name and the ethos it conveys is a wee bit problematic if you believe, like I do, that the white-tailed deer, despite having a cute white tail and all, is the biggest ecological calamity to hit the midwest since like forever. My partner in bio-blitzing, Megan Osika, spotted a rare aquatic moss, new for Delaware County. and today (Sunday September 16) I went back to try and get a 50% decent photo of it. Here’s the moss, Fissidens fontanus. 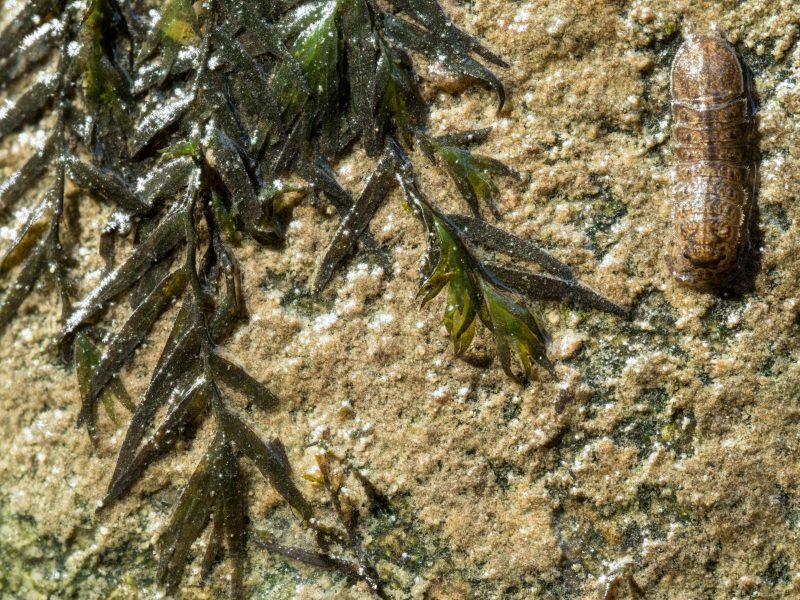 Fissidens fontanus is an aquatic moss of slow-moving streams. While there, I had the pleasure of also encountering (at least) six flowers and six fruits. Here they are, in the order I saw them, more or less. 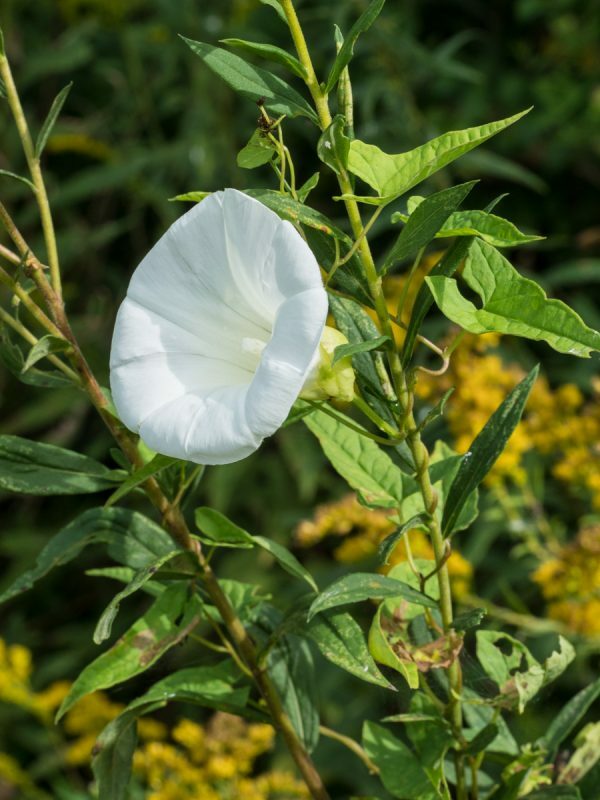 Not everybody’s favorite plant, owing to its rapid growth as a vine that crawls and climbs over everything, hedge bindweed, Calystegia sepium is nonetheless a pretty plant and native to North America. 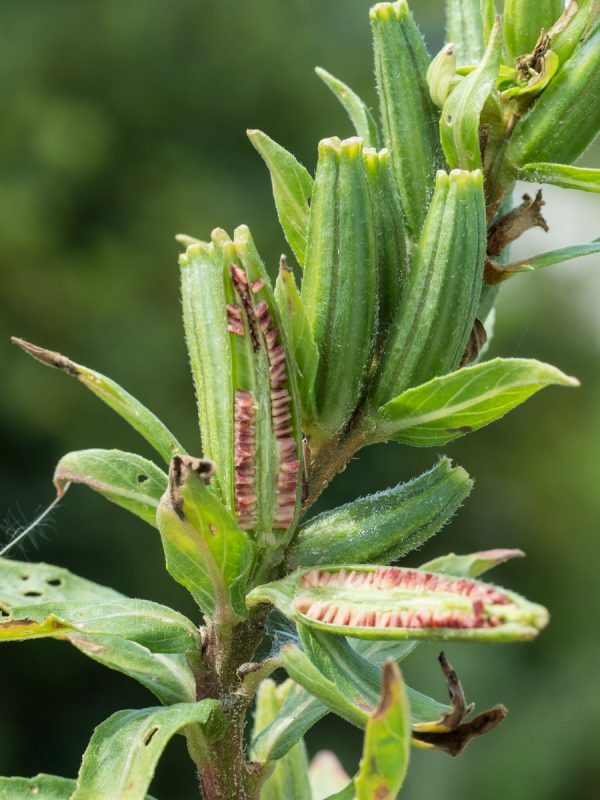 The flwers, produced single in the leaf axils, have fused petals but are symmetrical in form. The 5 inconspicuous sepals are concealed by two leafy bracts. The ovary is superior, and 2-celled (bicarpellate). Hedge bindweed, Calystegia sepium is annoying but pretty. The fruit of the Apiaceae (parsely family) is a “schizocarp,” i.e., a “split fruit” that forms when a syncarpous composed of two carpels, each containing a single ovule, ripen and then divides into two single-seeded unit that are dry, indehiscent, and disperse as do achenes. Quuen Anne’s lace, Daucus carota is a common weedy member of that family that is abundant and conspicuously fruiting today. The inflorescence, of course, is a compound umbel. Queen Anne’s lace, a member of the parsely family, produces a schizocarp fruit. Near to the parking lot edge where the Queen apparently dropped her lace, there is a restored prairie rich in prairie grasses. Granted we didn’t formally and officially cover the grass family (Poaceae) in class, but yesterday at Battelle Darby Matro Park we saw another prairie restoration and the instructor pointed out Indain grass, Sorghastrum nutans. That grass is actually flowering now! Note the tiny petal-less flowers with relatively large drooping stamens well situated to release pollen into the wind, and relatively huge feathery stigmas, antenna-like, great at snagging the pollen in the breeze. The grass inflorescence is a spikelet; here they spikelets are arranged in a loose panicle. 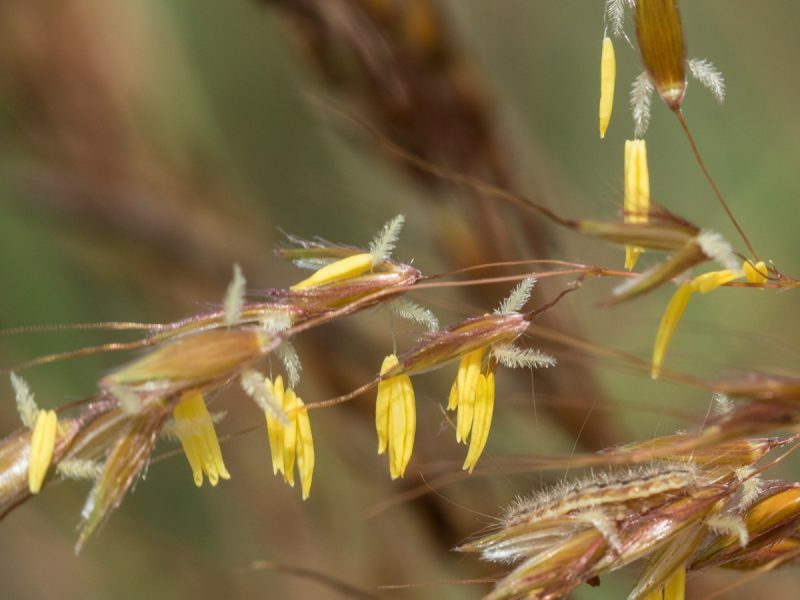 Indian grass, Sorghastrum nutans, is a prairie grass that flowers late in the season. A weedy little clover-like plant is in bloom. It’s black medick, Medicago sativa, in the pea/legume family (Fabaceae). Like nearly all legumes, the flowers are zygomorphic, with a peculiar petal arrangement sometimes called “papilionaceous,” meaning “butterfly-like.” There are 5 petals that are mostly separate from one another: a large “banner” petal on top; two smaller “wings” on the sides, and; two petals fused at the tip, forming a “keel” that surrounds the stamens and the pistil. The gynoecium is unicarpellate, and the flowers are hypogynous with a superior ovary. The inflorescence is a head-like umbel. The genus Medicago (which includes alfalfa, by the way) differs from the clover genus Trifolium in the fruits. In fruit, clovers retain papery vestiges of the corolla, whereas in hop-clover and alfalfa, the fruits are fully exposed. 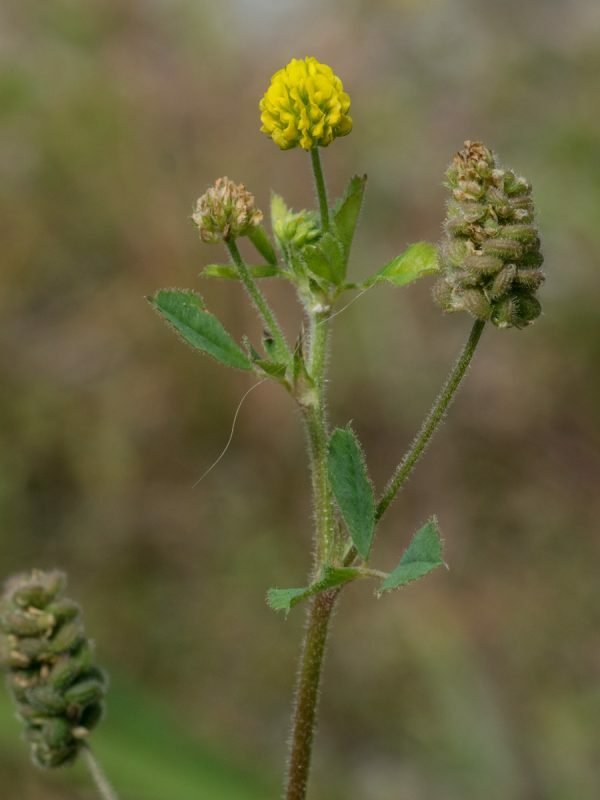 Black medick, Medicago lupilina, is a clover-like legume. It differs from clovers (genus Trifolium) in the fruits. One of our least favorite plants, bush honeysuckle (Lonicera sp., probably in this instance L. maackii) is all too common in our woodlands. 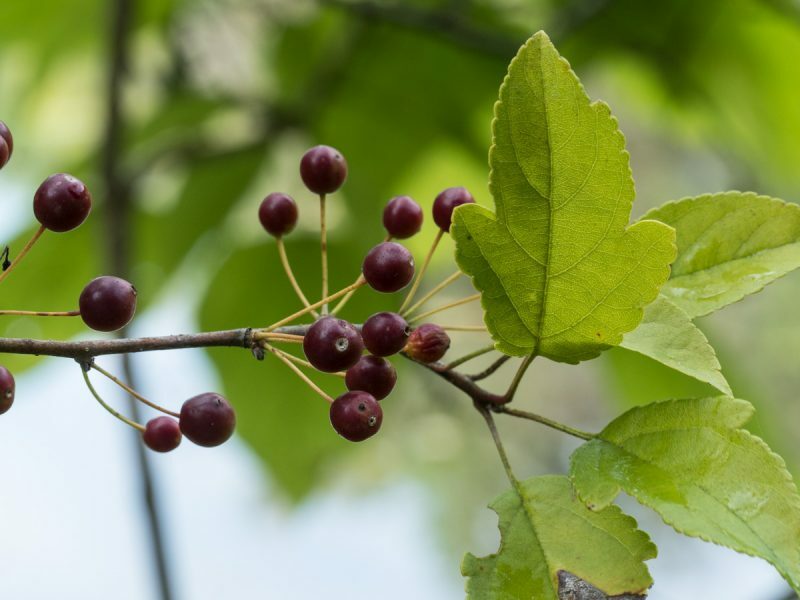 The fruits are berries, produced in pairs on solitary peduncles in the axils of ordinary foliage leaves. Bush honeysuckle produces berries that are eaten by birds, and so the seeds are spread. Along a pond there is a stand of blue lobelia, Lobelia syphilitica, a showy and native member of the harebell family, Campanulaceae. 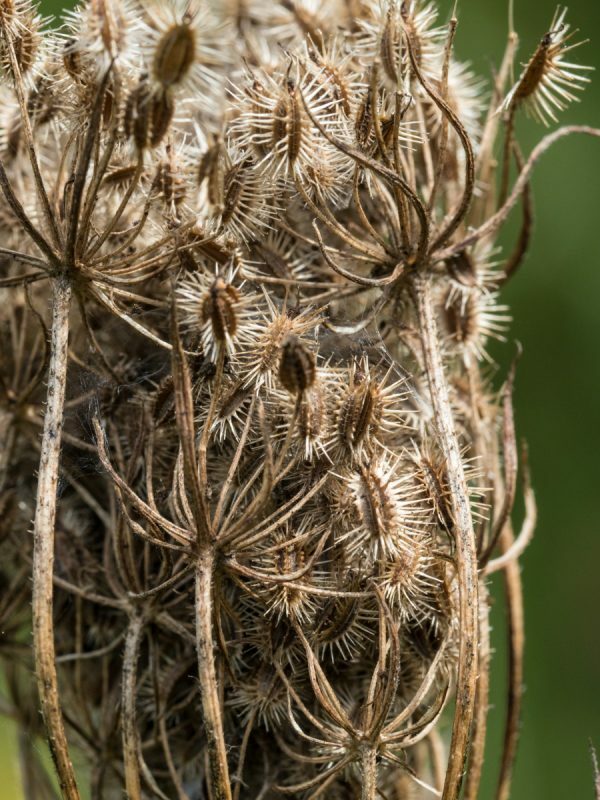 This family, closely related to the Asteraceae, has a number of flower features in common with the asters. The flowers are epigynous, sympetalous (petals are fused), strongly zygomorphic, and the stamens are fused by their anthers into a tube. The stamens split opens towards the inside of the tube, and the pollen is presented on the backs of the stigma lobes. Unlike the asters, however, individual flowers, not the inflorescences, are showy. The inflorescence is a spike. 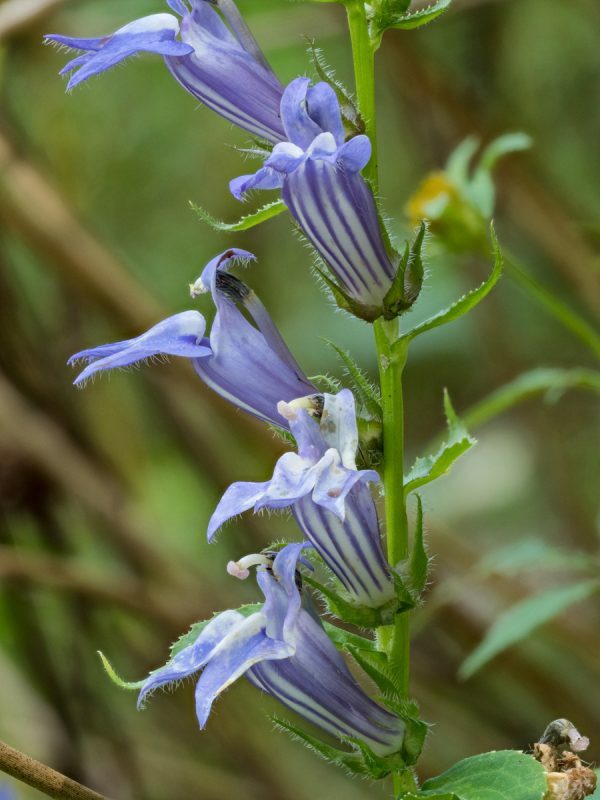 Blue lobelia, Lobelia syphilitica, is a showy wildflower common along the edges of ponds. A little farther back from the pond edge is a hawthorn tree in fruit. They’re a bit of a challenge to ID to species, so for now I’ll just say “Crataegus sp.” and admire the fact that this is one of the pome-producing members of the rose family (Rosaceae). It isn’t super obvious these are pomes. The scars at the upper end of the fruit hint to an inferior ovary, and a cross-section confirms that the ovary is embedded withing the swollen hypanthium. The inflorescence is a few-flowered (few fruited) umbel. 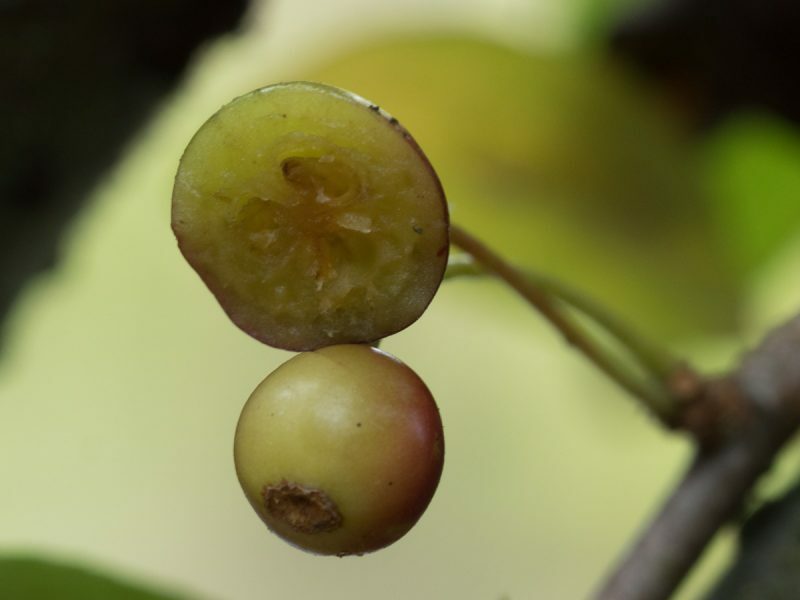 A cross-section of the hawthorn fruit shows it is a pome. A slender wetland herb is growing at the pond margin. It’s an annual in the smartweed family (Polygonaceae) called “water-pepper,” Polygonum punctatum. In case you wondered why smartweeds are called that (did they get great SAT scores? 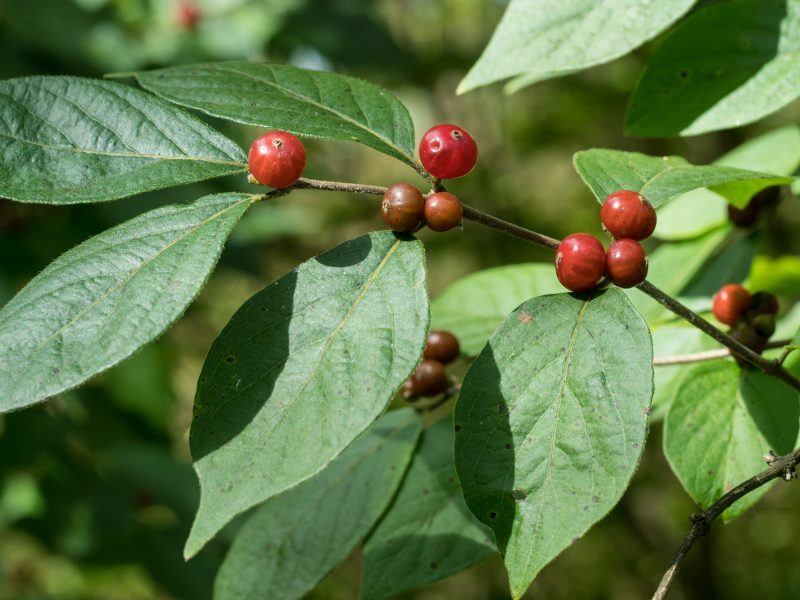 ), it’s because some of them, including this species, have hot-spicey foliage that “smarts” your tongue if you nibble a little of it! The flowers are so small it is difficult to distinguish their parts in the field. References such as this “Go Botany” site (link) say there are 5 perianth parts that are petal-like sepals (“tepals”). The style is 3-parted and the fruit is a trigonous (triangular in cross-section) achene. 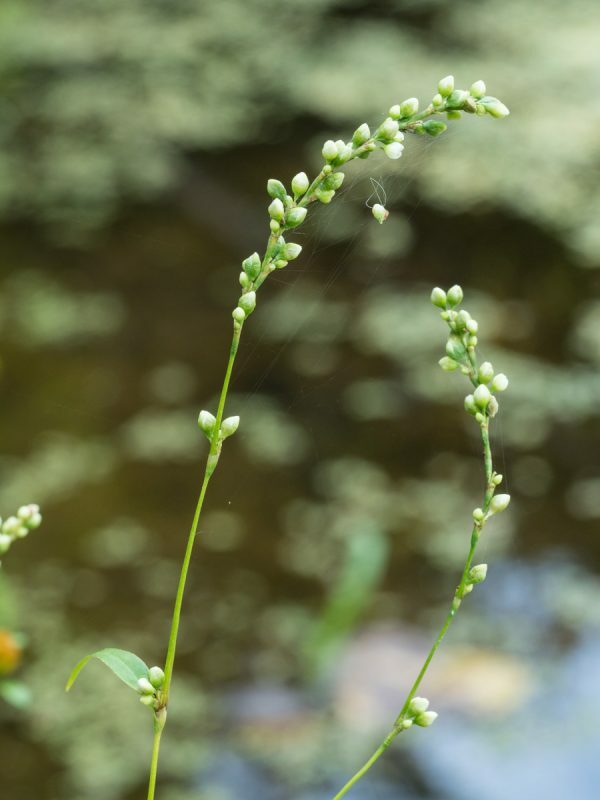 Water-pepper, Polygonum punctatum, is a smartweed that smarts. Flowering dogwood thrives at the edge of the forest here. Recall that the showy so-called “flowers” of flowering dogwood are actually inflorescences –capitula (heads) of individually small flowers. Today the dogwood is in fruit. The fruit is a drupe. 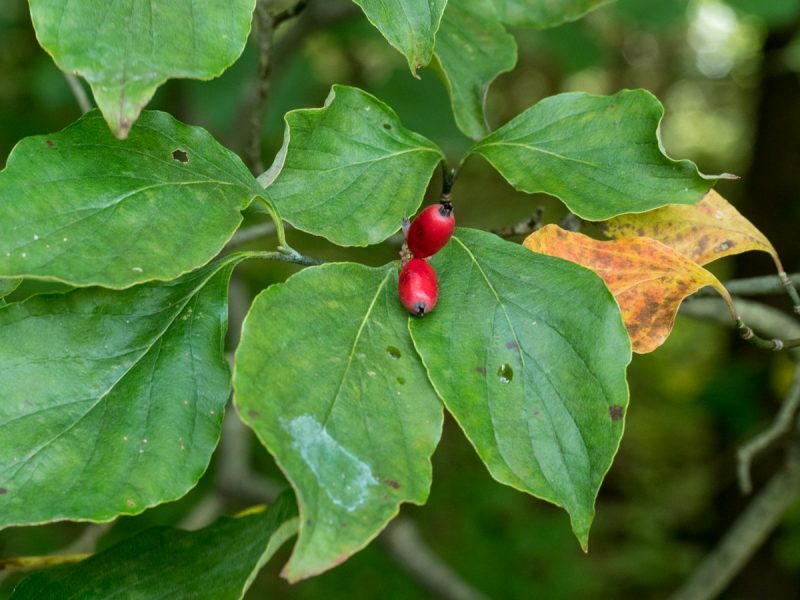 Flowering dogwood, Cornus florida, produces drupes in a capitulum. Herer, though, only two have matured (or perhaps others have been picked off by birds). 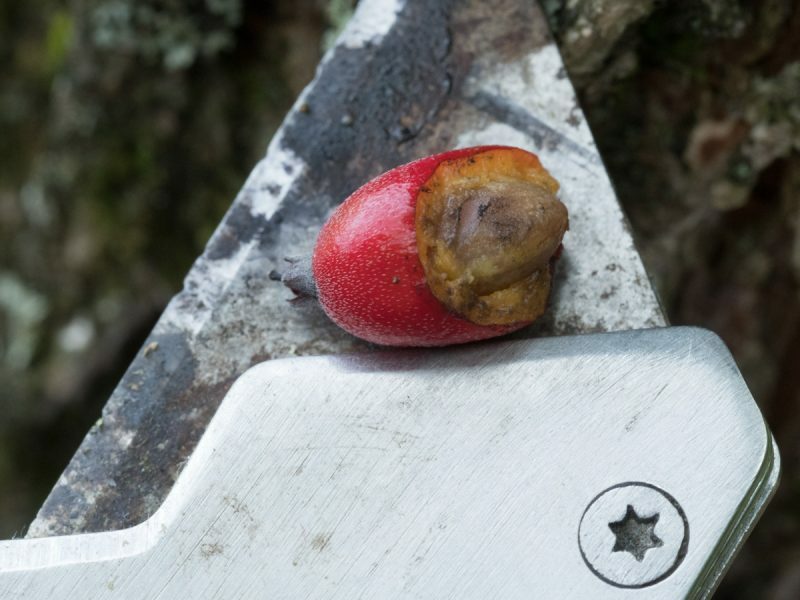 Here’s a dissection of the dogwood drupe, showing the single large “stone” (seed covered by endocarp) within. Whoa. A parasitic plant! 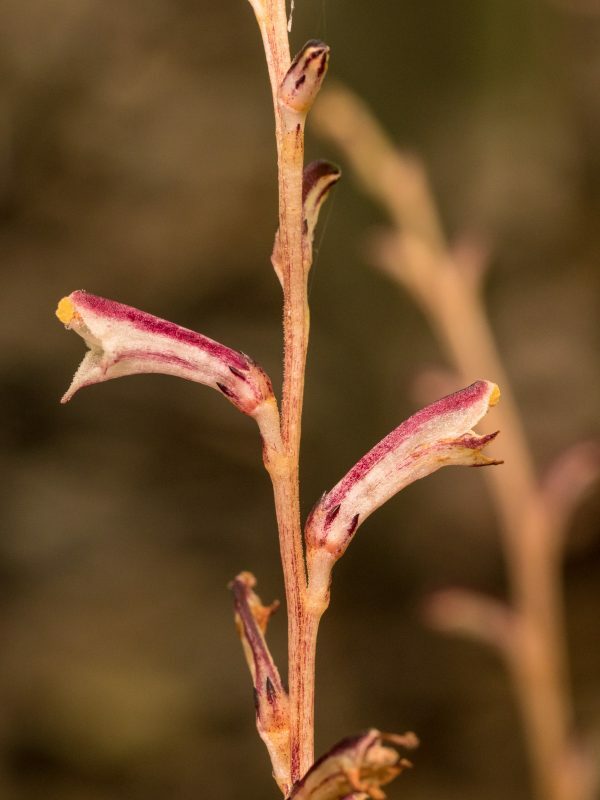 This is beech drops, a member of the broomrape family (Orobanchaceae) that is very aptly named genus-wise Epifagus, which translates directly to “upon Fagus” (Fagus is the genus of beech). Our Epifagus virginiana is indeed parasitic on the roots of American beech, Fagus grandifolia. It doesn’t harm the beech trees; they are so big and this plant is so small. The flowers are 5-parted with a calyx only (no petals); the 5 sepals are fused into tube with slightly zygomorphic symmetry. The fruit is a small capsule filled with many tiny seeds. Beech drops, Epifagus virginiana, is a root-parasite on beech. Cool! Deeper into the forest, oak trees predominate. 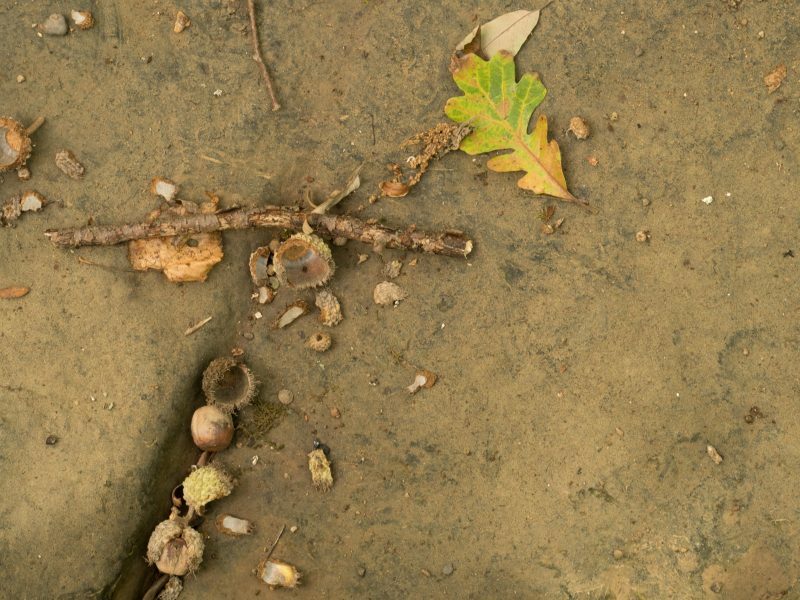 The white oak acorns are falling like hail today, making splashing sounds as they hit the stream where the rare moss grows. The acorn fruit is a nut –a large single-seeded fruit with a bony exocarp. Hey, acorns, what are you, nuts? Leaving the park I ran through my fruit tally and realized I had only logged 5 different examples, and not one was a capsule! Can’t have that, so I stopped off at the railroad track where, for the 1st flower “field experience” I collected the flowers of evening-primose, Oenothera biennis (Onagraceae). Today it’s in fruit. I dissected one of the capsules (note the inflorescence, a spike, contains several such fruits) to show the many seeds inside. The fruit of evening-primrose, Oenothera biennis, is a many-seeded capsule.